With the flood of new brands appearing every year now, it is almost impossible to even be aware of them – leave alone smell their offerings. Some brands make it to the perfume blogosphere, others stay under the radar. 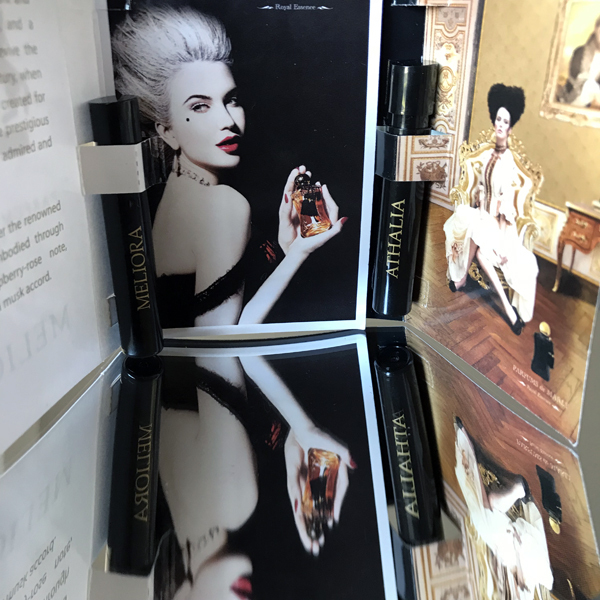 I learned about Parfums de Marly not too long ago: during my visit to the Nordstrom’s flagship store in Seattle in summer of 2016 I saw this brand for the first time and even got some samples from the overly enthusiastic SA (with whom we chatted about our favorite Tom Ford’s perfumes). After I acknowledged this brand existence, I realized that I must have seen it before in a couple of male-dominating perfume split/swap FB groups. But since other than Creed/Tom Ford/Amouage (with occasional Roja Dove and Xerjoff) rotation, the rest of what gets mentioned there are mostly designer perfumes, I think I was glazing over Parfums de Marly because their bottles reminded me of Ferrari perfumes, for which I didn’t care at all. Of course, if you look closely, it is obvious that the quality of Parfum de Marly’s bottles is much higher. The same, I assume, goes for perfumes, though I still haven’t tried a single perfume from Ferrari. Don’t get confused by the year on the bottles: according to Fragrantica, Parfums de Marly was created in 2009. 1743 was the year Guillaume Coustou created Chevaux de Marly (The Marley Horses), which became an inspiration for the creators of the brand. The positive side is that Parfums de Marley doesn’t claim any historical connections or secretly held through generations formulas. It’s a fantasy, a tale, a recreation of something that, even if existed, was probably completely different from what any of us can imagine. Through its original concept, Parfums de Marly rekindles the spirit of fragrances from the splendour of the XVIIIth Century, when the finest perfumes were created for King Louis XV as a tribute of the prestigious horse races he so fervently admired. Created by Nathalie Lorson in 2013, Meliora opens with a believable black currant note. Does it have promised raspberry? Probably. Or some other berry that gives Meliora its sweetness and smothers tartness of black currant after the first 30 minutes. Rose, Lily, Ylang-Ylang, Vanilla, Wood and Musk are probably there since the scent is more complex than just two notes that I can smell but for me these are just a list. After black currant settles down, not much is happening with Meliora: it is surprisingly linear for the price level brand positions their perfumes. Of course, if you happen to like exactly what you smell, it might be not the worst trait. I think I would have liked Meliora more if I haven’t found already black currant perfume that works for me better – Enchanted Forest by The Vagabond Prince. Also, I read somebody mentioning that Meliora reminded them another perfume by the same nose – Lalique Amethyst. I couldn’t check it since my sample went AWOL but I do not remember it being that black currant-y. Athalia was created by Alexandra Kosinski in 2016. Notes (from the brand’s site) include orange blossom, iris, amber and musk. Sometimes I wonder how brands decide what notes to mention. I have no doubts that this perfume uses aroma chemicals. But usually when you read descriptions of those, each one often sounds like a finished perfume’s description, even if it mimics specific note. So why not to use a more nuanced description? I realize that whether you like the scent is the most important part. And I rather like Athalia. But somehow $290 for 75 ml for 4 ingredients seems not right. Luckyscent thought so as well, so their list sounds more traditional: Incense, rose, bitter orange, iris, suede, orange blossom, cashmeran, amber, vanilla, vetiver. I liked Athalia even before Luckyscent’s attempt to save graces (both the story they tell and the perfume description are much more detailed than what brand provides on their own site), but I was puzzled by the promise of orange blossom: I can’t smell it in this perfume at all. It isn’t my favorite scent but I thought that I knew it well – at least how it’s usually represented in perfumery, be that natural or artificial ingredient. In general, it’s not surprising when some notes are not recognizable on their own in perfume (especially by my nose) but it’s a little unexpected when it’s one of four officially mentioned aromas in that perfume. Since I liked Athalia, I’ll probably try to wear it once or twice from what is left in the sample – just to make sure that I do not need it in my collection. 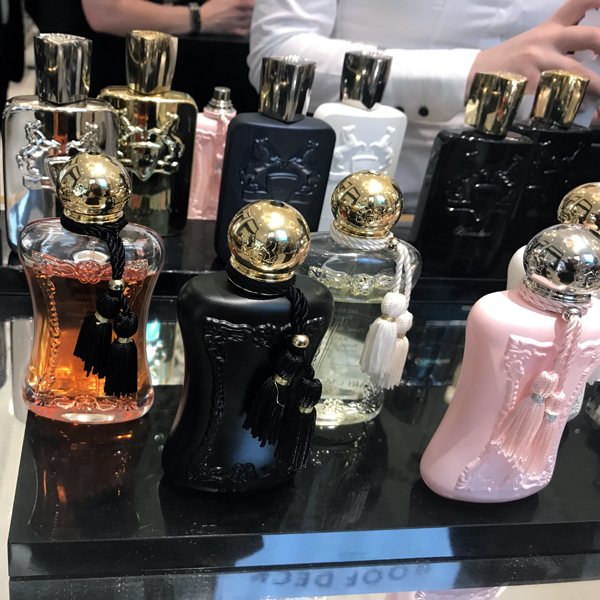 Parfums de Marly’s creations remind me of Mugler’s perfumes: loud, persistent and clearly not natural (which isn’t an issue for me). I like their masculine line much more (eventually, I’ll write about some of those), but if you were to try just one perfume from the feminine collection of this brand, I think Athalia is a good choice.